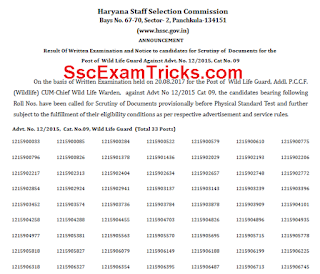 HSSC Wild Life Guard Result 2017 - Haryana HSSC Advt. No. 12/2015 Admit Card/ Result 2017 - Merit List - Haryana Forester Admit Card 2017 - HSSC Advt. No. 12/2015 Re-Exam Date/ Schedule Call Letter 2017 - www.hssc.gov.in. 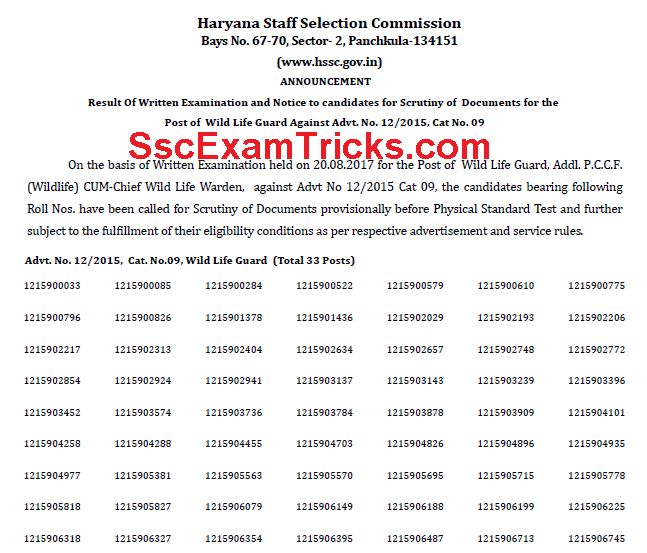 HSSC latest updates is that HSSC has declared the Result 2017 for 33 posts of Wild Life Guard on official website www.hssc.gov.in. The examination has been scheduled in the various date of November 2017. The admit card can be downloaded from now on www.hssc.gov.in. Latest news (30.10.2017) -HSSC uploaded Mock Test link for Computer Based Exam Held on 06th - 15th November 2017 under Advt. 12/2015 Cat. No. 1, 2, 3, 4, 5, 6, 7 & 8. The latest updates is that Haryana Staff Selection Commission has uploaded the mock test link on official website for the computer based examination scheduled in November for various category under advt. no. 12/2015. The good news is that HSSC has re-scheduled on 29th October 2017 at per admit card on the official website. HSSC Forester Admit Card can be downloaded from the official website on or after 24th October 2017. No Separate notice or information will be notified to the candidates. The rest of the information will be same as it was notified on 22nd September 2017. 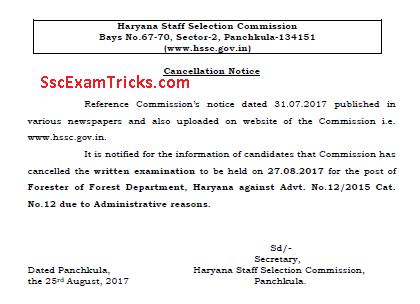 Due to the administrative reasons, Haryana Staff selection commission has cancelled out the forester exam under advt. no. 12/2015 category number 12. The new date will be notified soon through a notice on the official website. Those candidates who are looking for appearing in the examination must download and read the notice of exam cancellation from the link given here. The simplest process for downloading HSSC Advt. No. 12/2015 has been discussed here. First, go to official website www.hssc.gov.in. Look into the latest news which has been highlighted in blue colour on the home page of the website. Click on the link given as "Click here for the recruitment of Advt. No. 11/2015" on the page. Click on 'Login' button appears on the screen. Enter the registration number or login ID and password. Press login button. You will be sent on your account. Find the link to be mentioned as 'Download Admit Card'. It's location may be available with the button 'View Profile' or on the right top of the link carrying the blinking "New" sign. Press on it and let the system download your HSSC Advt. No. 12/2015 Forester Admit card 2017. Take a print of all the three pages. Don't try to be over smart to print only the first page of HSSC Admit card. From these pages of downloaded online admit card, the first page will ask a passport sized coloured photograph which you must attach and do the attestation from the gazetted officer. During the examination, you will have to make signature and thumb impression on it in the presence of the invigilator. The second page will be an instruction page. The third and last page will be given to you after completing the candidature formalities. In case you forget these items, click on the forget button and mention your mobile number into it and wait for the massage to be sent by the HSSC. You will receive your login ID and password on the registered number; the mobile number given at the time of registration.